Up until a few months ago, we knew virtually nothing about the Zika virus—or what it even looked like. 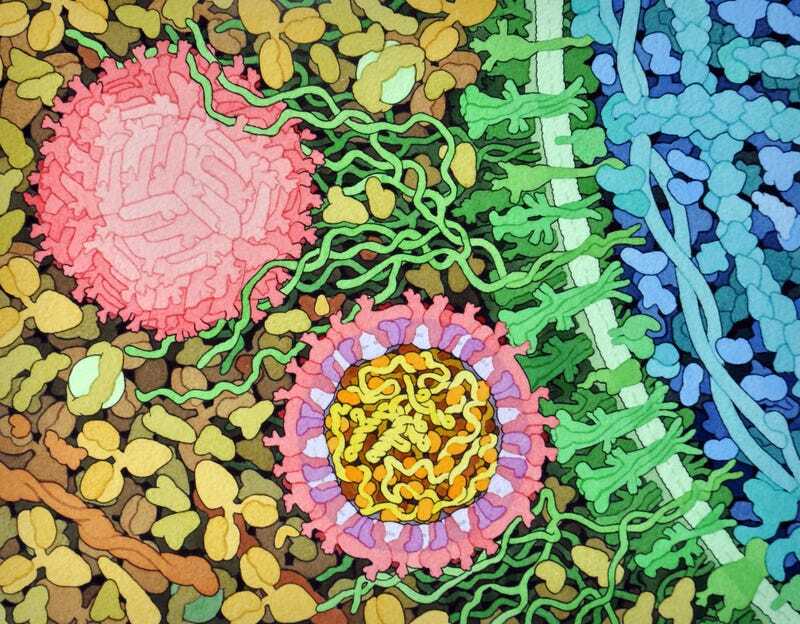 But a beautiful new illustration by David S. Goodsell reveals its hidden details, while also showing how the dreaded virus goes to work. Scientists have been hard at work trying to untangle the mystery that is the Zika virus this year. The pathogen was discovered in Uganda back in 1947, but it wasn’t considered dangerous. Things have changed after Zika was linked to birth defects, and the virus is now propagating through parts of South and Central America at epidemic levels. The Zika virus has been officially linked to microcephaly, a condition in which fetal brains grown abnormally small, as well as Guillain Barre syndrome, a rare disorder that causes temporary paralysis. Insidiously, Zika can breach the placental barrier and disrupt the development of the fetal brain. Back in May, cryo-electron microscopy finally uncovered the virus’s appearance. 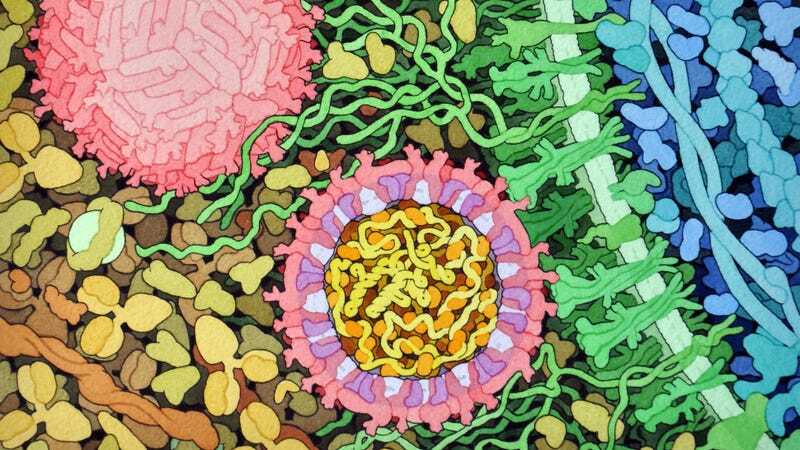 In the artistic rendering above, molecular biologist David S. Goodsell from the Scripps Institute used color and shape to convey the virus’s appearance and function. The spherical structures (shown in pink) represent a pair of Zika virus particles in a blood vessel filled with blood plasma cells (tan). Both particles are on the verge of penetrating a cell (blue), and they’re binding to the cell’s protein receptors (green). The virus at the bottom right is a cross section of a Zika particle. The illustration shows viral proteins (red) protruding like studs from its outer surface, with membrane proteins (pink) embedded within a fatty layer of lipids (light purple). These studs, of which there about 180, protrude from the particle, allowing it to bind itself to certain human cells, including antibodies and host receptors. This also explains why the virus can attack nerve cells and critical cells required for normal fetal development. The viral genome itself can be seen deep inside the particle (yellow) coiled around capsid proteins (orange). Zika is actually quite similar in appearance and function to other flaviviruses, such as dengue, West Nile, and yellow fever. This is actually good news, because it means that ongoing efforts to create vaccines for these related viruses could be applied to Zika.